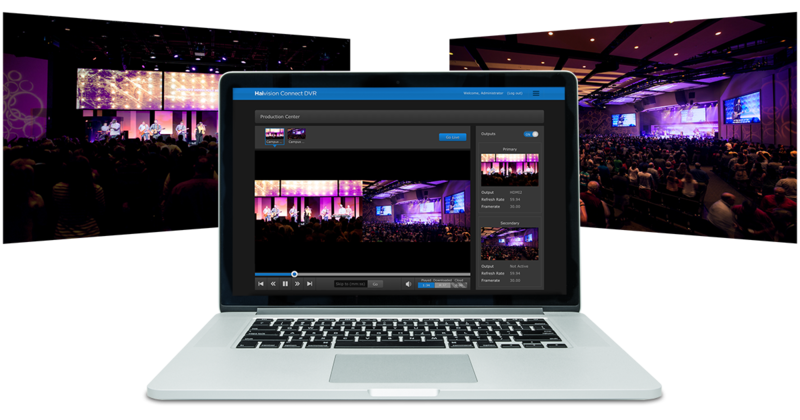 Haivision Connect DVR is a cloud-based service that connects multi-site ministries with time-shifted video playback to ensure the inspirational message of your main campus is seamlessly shared with remote or temporary locations, anywhere in the globe. This end-to-end solution includes everything from the source encoder to the dedicated playout appliances and is also highly scaleable to an unlimited number of remote locations. Haivision Connect DVR simplifies how you deliver high-quality single or dual-stream video to remote venues. This end-to-end solution brings together all the components you need, integrating Haivision’s high-quality KB encoder, Akamai’s industry leading Content Delivery Network (CDN), and the compact and powerful Display Engine DVR remote appliances. With an easy-to-use web-based user interface, staff and volunteers can get set up quickly to preview, play and share inspirational messages from the main campus at remote locations, according to the schedule of their local service. Powered by the KB internet media encoder, Haivision Connect DVR delivers the highest quality HD experience to remote campuses so that your members feel like they are watching at the main location. Haivision Connect DVR service also saves you time and reduces the costs and complexity of your workflow by using low-cost internet connections to distribute your streams, without sacrificing quality. Local caching makes sure new content is safe while it is being streamed, making it immediately available for local, stable playback, regardless of network conditions. Haivision Connect DVR gives remote campuses the control and flexibility to keep their own pace and play the main campus message at the right time during their service. Once the event starts, the Display Engine DVR appliances at remote campuses automatically start caching the live service where they can preview the stream and time-shift it to flow with the pace of the local service. Haivision Connect DVR supports synchronized dual video streams, so the remote campus can preserve either the full stage and IMAG camera angles, or the presenter and presentation, from the main campus. Hill Country Bible Church extends their gospel to new audiences with DVR streaming.